For the past month, ground zero for "max pain" trades had been concentrated in equities, and specifically growth and tech stocks, which slumped into a bear market amid "peak profit" (and "peak iPhone") and economic slowdown concerns, leading to dramatic losses for hedge funds which have been forced to liquidate positions and meet redemption requests ahead of a November 15 deadline, while getting crushed by a dramatic squeeze in value stocks. However, that changed in recent days when first the collapse in oil - coupled with a historic short squeeze in nat gas - redirected attention to the dramatic events in the commodity sector, leading to major losses for commodity CTAs and momentum traders. 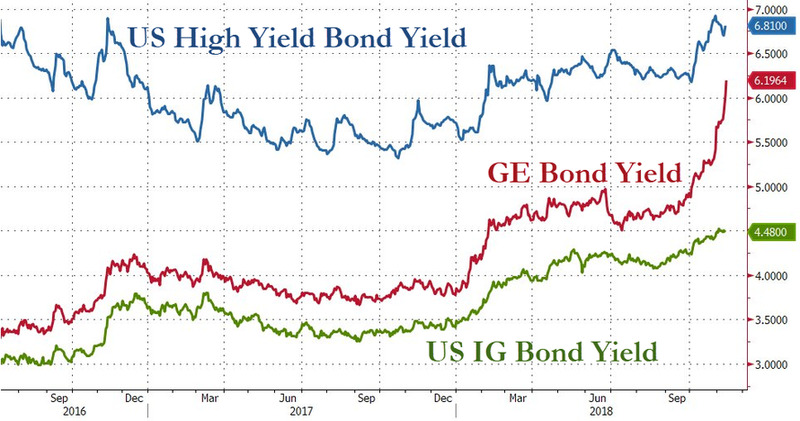 Meanwhile over the past 48 hours the sudden blow out in GE credit to junk bond levels, has shaken the investment grade bond market, prompting renewed fears about hundreds of billions in future "fallen angel" bonds, whose inevitable downgrade to junk could lead to the next bond market crisis according to such investors as Guggenheim's Scott Minerd. Commenting on the "credit contagion" move, Nomura's Charlie McElligott writes this morning that the Credit market’s “catch down” to Equities "was a significant development of the past few days." According to the cross-asset strategist, "this long-awaited spread widening is a significant NEGATIVE development for the risk-asset macro regime, because as per Quant Insight factor PCA model, “Corp Credit” is the 2nd largest factor driver / price sensitivity for SPX, NDX, SXXP, MXEF and the largest factor input for NKY, while also too the largest price-driver for FX risk-proxy EURJPY." It’s not just secondary price action either - as McElligott notes, yesterday’s primary deals were only 1.4x’s covered (half the 2018 YTD average cover ratio) while issuers paid nearly 15bps in concessions to price deals. He goes on to note that the concern is "cycle-related, as the wave of 1) debt for buybacks and 2) debt for M&A has much of the IG universe teetering from BBB to BB (Xerox on negative watch, with Conagra and Kellogg Co recently downgraded." Meanwhile, as noted earlier, risk sentiment has also gotten hammered by the relentless downward price action in Crude Oil over the course of the past few weeks which was "obviously horrific" with "macro catalysts of USD rally and supply/demand OPEC concerns which along with dealer “short gamma” in WTI is creating extra violence, which is perhaps Mexico hedge related." However, it was yesterday’s “tap out” liquidation flow in WTI, in which oil tumbled -7.1%, its worst one-day return since Sep 2015, which the Nomura strategist also believes was exacerbated by the unwind of a "long WTI / short Nat Gas" spread trade—over the past 12 sessions: "WTI is -16.8% (including today’s rally) while Nat Gas is +51.9% (today’s explosive stop-out alongside record low storage, producer production cuts and very cold weather burst)." What are the implications for traders? Not good: McElligott writes that U.S. Equities funds are continuing to reduce their net-exposure via selling “longs” while pressing “shorts”—over the past 5d, resulting in a 2.4% drop for Nomura's “1Y Momentum Longs” while “1Y Momentum Shorts” have been "CRUSHED" -4.4%, which also corresponds to the ongoing performance-bleed caused by the rally in underweighted / short “Value” factor against still-crowded “Growth” longs. This is a significant shift in sentiment, because as the Nomura strategist observes, the "netting-down" suggests an evolution from pure “de-risking” or “VaR-down” flow of the past month, to now expressing a more directionally bearish view on U.S. Equities.